The following article was written by Editor Anne Boyd, and originally appeared at Ferntree Gully News. 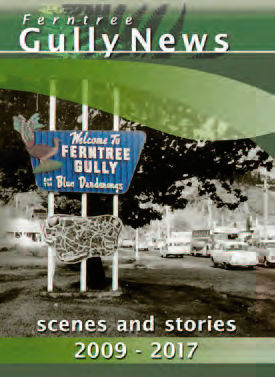 Ferntree Gully News: Scenes and Stories is a selection of stories and photographs gathered from the first fifty issues of Ferntree Gully News. Part personal stories, especially of migrants who ‘made a home in the Gully’, part celebration of some of Victoria’s oldest sports and arts groups, part evocations of a special place facing twenty-first century change, the book form gives some permanence to the ephemeral nature of a bi-monthly newspaper. Dandenong Ranges and the increasingly urbanised fringes of the city of Melbourne. Follow the story of the newspaper as it gathers confidence over eight years, or dip in anywhere to enjoy the conversations of a generous and engaged community. For more information, please visit the Ferntree Gully News website.